The newfound ringed galaxy PGC 1000714, seen here in a telescope image, is one of the rarest types of galaxies ever observed. The left panel shows a false-color image of PGC 1000714, while the right panel highlights the galaxy's outer ring (blue) and diffuse inner ring (light green). Astronomers recently mapped the rarest type of galaxy ever found: an elliptical galaxy sporting rings of young stars. Most galaxies, including our own Milky Way, are spiral or elliptical. But this recently mapped galaxy, called PGC 1000714, is unique. Located about 359 million light-years from Earth, it has two rings: an outer ring and an inner ring. The rings are made up of mostly young stars, while the core is made of older, redder stars, researchers reported in a new study describing the findings. The inner ring appears older than its outer counterpart, study co-author Patrick Treuthardt, an astrophysicist at the North Carolina Museum of Natural Sciences, said in the statement. Such "ring" galaxies are known as Hoag-type galaxies in honor of astronomer Art Hoag, who discovered a prototypical example of the galaxy type in 1950. Only 0.1 percent of galaxies ever observed are Hoag-type galaxies, Mutlu-Pakdil said. Current theories suggest that Hoag-type galaxies form when two galaxies collide and the typical spiral arm structure is disrupted, the researchers said. That leaves a ring of gas, dust and stars slowly spreading outward, similar to ripples in a pond. 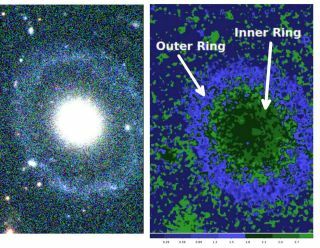 It's possible that the outer ring was formed when PGC 1000714 absorbed a smaller galaxy, while the older, inner ring was created in some other way, the researchers said. However, to know for sure, researchers will have to catalog many other galaxies like it. "Whenever we find a unique or strange object to study, it challenges our current theories and assumptions about how the universe works," Treuthardt said. "It usually tells us that we still have a lot to learn." The study was detailed online Nov. 30 in the journal Monthly Notices of the Royal Astronomical Society. You can follow us on Twitter @Spacedotcom. We're also on Facebook & Google+.